Wild Mushroom and Egg Yolk Raviolo with Black Truffle Cream Sauce | Have YOU Ben Starr Struck? I first had a raviolo (“raviolo” just means a BIG ravioli) stuffed with egg yolk at Joe Bastianich’s restaurant Osteria Mozza, where Mario Batali is the head chef. I dined there one night with the MasterChef finalists, and it was an eye opening experience. As I’m not accustomed to fine dining (because I can’t afford it), I had never eaten that level of food before. Pretentious “haute cuisine” is repulsive to me, but Mozza’s menu is all traditional Italian food, nothing stuffy or fancy, just executed PERFECTLY. (Their grilled octopus made me weep, it was so good.) I had never seen a ravioli so large, and slicing into it, the egg yolk oozed out on the plate and made everything so sinfully rich. Later in the competition, Jennifer (who ultimately won) made a wild mushroom and egg yolk raviolo in the semifinals, and swept the competition with it. Watching her make it from the balcony, I was like…WOW! That seems like a very sophisticated dish, but it’s not at all difficult to prepare. So when I was at my local market today and wild mushrooms were on sale, AND they had black truffles on sale for $8 each…I knew I had to do the mushroom/egg yolk raviolo, and crown it with a black truffle cream sauce. That blends the best things on earth that go so perfectly together…truffles and eggs, mushrooms and cream, and pasta. If you’ve made homemade pasta before, this recipe will not be difficult for you. By far, the hardest part of this whole recipe is the pasta. And because the raviolos have to be cut so large, you can’t “cheat” and buy wonton wrappers. You gotta make it yourself. And to make it properly, you gotta have a pasta machine. It’s practically impossible to use a rolling pin and get the pasta dough thin enough for a proper ravioli. In order for the yolk to cook perfectly, and still be molten when you slice into it, the pasta dough has to be very, very thin. Which makes it trick to work with. Experience is the key. Don’t try this recipe if you’ve never made homemade pasta. Make spaghetti or fettucini first. Get the hang of the pasta machine. Then try this one. Mix together until it comes to a firm dough. You may need to add a bit of additional flour to get the dough to stop being sticky. Then knead it for 10 minutes until it’s smooth and firm. Wrap with plastic wrap and refrigerate for 30 minutes to allow the gluten in the dough to relax. Stir constantly until the mixture thickens and reduces slightly. Season with salt and pepper, and add the truffle butter. Stir well and set aside for at least 30 minutes. When ready to serve, dilute the now-thick sauce with half a cup of milk and reheat gently. Each variety of mushroom tastes different. Shiitake or crimini or oyster mushrooms are generally available fresh at decent gourmet markets, and work fine for this recipe. If you can find (or forage) morels or chanterelles, even better! Portabellos are a last-resort. Don’t bother with white button mushrooms, they don’t have enough flavor. You can use dried wild mushrooms for this recipe if you can’t find fresh…you only need 4 ounces in this case. Clean them of any grit, pour a few cups of boiling water over them and let them sit for an hour, drain off the water. You can save that water to add to soups or sauces. Chop the mushrooms and proceed with the recipe. Stir and continue to cook until most of the wine has evaporate. Remove from the heat and let cool. Divide the chilled pasta dough into 4 pieces. Flatten each piece and send through the pasta rollers at the widest setting. The dough may tear, this is normal. Fold in half and send through the machine again. Make sure there is plenty of flour on the table and that you dust a little flour onto both sides of the pasta after each rolling. Continue folding the dough in half and sending it through the rollers until it comes out smooth. Dial down the pasta machine to a thinner setting and pass the dough through. At some point your ribbon of dough will be too long to work with, so cut it in half, set the other half aside onto a floured surface, and work with half the ribbon. Continue dialing down and passing the dough through until you have it at the thinnest setting. The dough is VERY delicate and thin at this point, you must handle it carefully. Cut the dough with whatever round object you can find in your kitchen that is 5″ to 6″ in diameter. I use the lid of my flour bin. You probably don’t have a cookie cutter large enough. Use a bowl or a large can of tomatoes… You’ll find something. Continue rolling out dough and cutting until you have 24 circles, or cut out a few more just in case some tear. You will not use all the dough, but I gave you extra dough for screw ups. Set each circle onto a lightly floured surface, and cover them all with plastic wrap to keep them from drying out too quickly. For the next step, it’s nice to have a second person who can boil the raviolos right after you assemble them. Onto one circle of pasta, place 1 Tablespoon of mushroom filling. 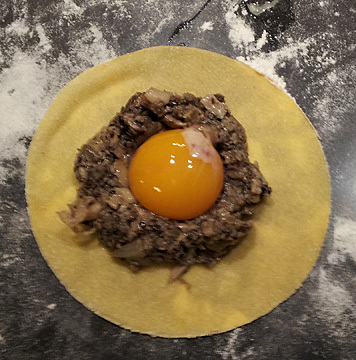 With your fingers, make a “nest” in the center of the mushroom filling to hold the egg yolk. Crack an egg into your hand and let the white drain off between your fingers. Gently set the yolk into the nest of mushroom. Dip your finger into a cup of water and moisten all the visible pasta around the mushroom nest. Gently set the second circle of pasta on top and gently press all around. You want to eliminate as much air inside the raviolo as possible, which can cause them to inflate and explode when you boil them. Using the tines of a fork, GENTLY press down onto the edges to seal them. Don’t poke the end of the fork into the pasta, just press down with the bottom of the tines. You don’t want to even make an impression…you’re just using the pressure to help seal the edges. Move the raviolo gently to a floured spot out of the way, and make some more. If the pasta dries out, it may tear while you’re working with it, so you want to move quickly but carefully. Bring a pot of heavily salted water to a boil. The water should taste as salty as the ocean every time you cook pasta. Lower the heat so that the pot is gently simmering. Add a few Tablespoons of olive oil to the water. Using a wide slotted spoon, preferably plastic, lower the raviolos gently into the barely simmering water and cook for 2 minutes ONLY. I like to cook no more than 2 or 3 raviolos at a time. After 2 minutes, gently raise the raviolos out of the water and transfer them to a pan that’s been sprayed or rubbed with olive oil. The raviolos tend to look a little ugly when they come out of the water. You can trim them up using a large cookie cutter, provided you still maintain a few millimeters of sealed pasta around the edges of the mushroom filling. Warm up the sauce, ladle it onto a plate or bowl, and top or 2 or 3 raviolos per person. Sit down to the most sinful, rich, earthy, delicate meal you’ll probably ever have. This entry was posted in Main Courses, Recipes, Vegetarian and tagged Italian, MasterChef, pasta, ravioli, truffle, vegetarian. Bookmark the permalink. Hi Ben! I’m a huge fan of Master Chef, and remember the finale when Jennifer won with the mushroom/ Egg raviolo; I found some truffle pate, and one of my colleagues gave me some duck eggs, so I went to work…thanks so much for the recipe, the truffle cream was amazing; I would urge you to tryout with a fresh Duck egg. And you are correct…the thinner the pasta the better!! Almost three years later. There is no way I can get truffles so what do you recommend as a,substitute? Also can the pasta be rolled a little thicker so egg won’t be really runny? Use any type of mushroom as a substitute, though the flavor won’t be the same. You can also order canned truffles, which aren’t as good, but will give you at least some of the flavor. Truffle oil also mimics the flavor and is widely available. I don’t recommend rolling the pasta any thicker. It becomes gummy and chewy. The point is for the yolk to be runny and rich when you cut into it! 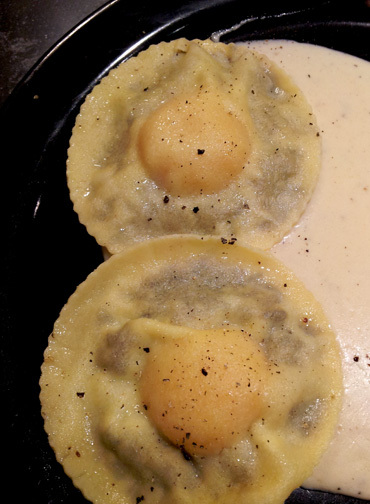 If you don’t like a runny yolk, cook the raviolo a minute longer. Leah, these will not freeze very well, the pasta is so thin it will become very brittle and delicate, and the egg yolk will change texture and not run properly after being cooked. These are best served immediately!